August bank holiday with a good forecast could mean Snowdonia’s about to be overrun with visitors. So we set off early from Campbell’s Cottage along the railway to the Lakeside Café, Tanygrisiau, then up the Wrsygan incline through the side of the mountain to the slate workings. No-one in sight. Explored a few mine adits, ate some bilberries and climbed to the top of Moel yr Hydd. Still no-one in sight. Down the other side and up to the summit of Moelwyn Mawr. Yet still no-one to be seen. Onwards to Craigysgafn for lunch and there in the distance, tiny figures about a mile away; we could see two other walkers. Along the way we set the camera timer to photograph the two of us on each of the peaks. I was about to set up the camera on Moelwyn Bach when we were mobbed by a mass of insects. 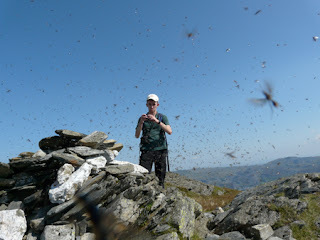 The mountains of central Snowdonia might have been devoid of humans but the final peak had more than its fair share of bugs. Had someone buried their packed lunch in the summit cairn? Or was it Haydn’s aftershave?